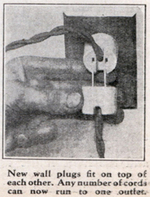 Is search engine marketing just like this 'new' wall plug? Just add it to your outlet and shazam! Five appliances work where only two did before. How does search marketing fit in with TV, radio and print advertising in your company? here's the reality of search marketing. Its one thing to say "you're doing search" internally and it's a totally different thing to have the searcher realize that "you're doing search". Isn't the point of doing search to have the searcher find you? and therefore realize that you're doing search? In his blog entry here, Gord emphasized a symptom experienced by a Tourism promotion department of a provincial government, something most often associated with big budgets. Here the joy of influencing eyeballs and feeling good about the brand awareness completely overshadows the statistical significance of the conversion capabilities of search. Buyer performs a search, clicks on link, becomes informed about product, purchases online and voila, a direct correlation to purchase is made. While at 3Com (I introduced the company to search engine marketing in 2004), it was clear that the big budget projects of reaching out via direct mail, telephone followups and the like were more fun for some than the simple and real-time aspects of search engine marketing. Change comes hard for some. It's what they had always done. So, how does search engine marketing fit in your marketing plan? Peter Brockmann is President of Brockmann & Company, a communications industry consultant and researcher with over 20 years experience. Learn more at www.brockmann.com. Let's be honest. How many of you struggle to get out of bed and then somehow you drag yourself into work? Welcome to the club! While grudgingly preparing for work today, I was watching the Today Show and saw a guy who really knows how to motivate people. Judson Laipply is an "inspirational comedian" who is gaining widespread popularity after a video of his act called the "Evolution of Dance" became a major hit and one of the most downloaded videos on the Internet. Laipply's motivational message is pretty simple: The first step to creating the life you want is to understand the simple idea that life is change, according to his Web site. He illustrates this change in his video through a sequence of dance moves from various decades. It's pretty funny! And today, I couldn't wait to get to work to share it with my coworkers. We here at S&MM understand that motivation is a key factor in the success of sales and marketing professionals. On our Web site, you'll learn how empowered employees can help close deals, ways to incentivize your staff, and so much more. Now it's your turn. What's your motivation? Do you have a surefire way to motivate your staff? Share it with us. I’ve written about the show before, but yet again NBC’s workplace satire The Office has picked up on a real-world issue: How to give a great speech at a sales conference. In last week’s episode, Dwight (the office heel) ends up winning, to everyone’s chagrin, the regional salesperson-of-the-year award. But when he finds out that he must give a speech at the local sales conference, his fear of public speaking makes him panic (he recounts a tale in which he misspelled the world “failure” at a school spelling bee) and he turns to his boss and coworkers for help. Surprisingly, Dwight ends up wowing the crowd—by cribbing a Benito Mussolini speech and changing all references to global war to the “war at work” and replacing soldiers with “salesmen—and women.” He does this with much of his own flair, pounding on the podium with a crazy look in his eyes. 2) He injects relevance. By pointing out how big-picture notions apply to his fellow salespeople representing northeastern Pennsylvania, he keeps the audience engaged in his message: How salespeople must continue to fight the good fight. 3) He makes good eye contact. It’s apparent that Dwight actually did a lot of preparation beforehand. He takes cards with him onstage, but focuses more on the audience (even if it is with manic facial expressions). It’s clear he has practiced, proving the best presenters don’t rely on PowerPoint or other presentation materials because they know their subject matter. What presenting tips help keep panic at bay for you? Here are some pointers from S&MM on how to avoid being a dull presenter.